At its January 16, 2015 public meeting, the Medicare Payment Advisory Commission (MedPAC), the government agency that advises Congress on Medicare payment policy, addressed observation status as part of its discussion of hospital short stay policy issues. MedPAC Commissioners preliminarily, but unanimously, voted to move forward on a recommendation to count time in observation status towards meeting the statutory requirement for three days of hospital care (not counting the day of discharge) as a prerequisite to Medicare Part A coverage of a subsequent stay in a skilled nursing facility (SNF), but only if at least one of the patient’s days in the hospital reflected a formal inpatient admission. If this MedPAC recommendation were implemented by Congress as currently proposed, patients whose entire hospital stay was classified as observation or other outpatient status would still not have any Medicare Part A coverage for their SNF stay, regardless of how long they were in the hospital and regardless of the type of care and treatment they received in the hospital. 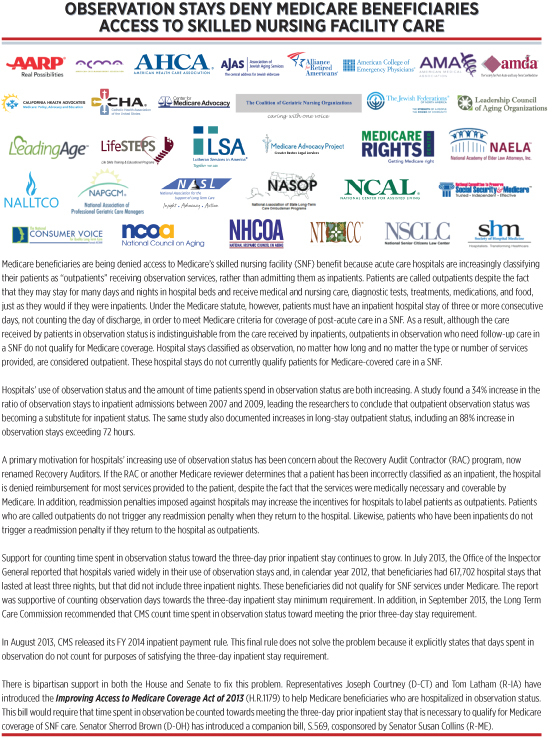 MedPAC staff’s analysis began with a description of three underlying causes for short stays in hospitals – “inpatient admission criteria are ambiguous and open to interpretation;” the profitability for hospitals of short inpatient stays; and Recovery Audit Contractors’ focusing their audits on short inpatient stays – and the effects of short inpatient stays on Medicare beneficiaries – denial of SNF coverage and liability for costs of drugs administered during the hospital stay. MedPAC’s preliminary recommendation on observation status and SNF coverage would continue the three-day hospital requirement, but permit coverage of SNF care under Part A if the patient was admitted as an inpatient for at least one day. MedPAC staff suggested that a small group of people would be affected by this change, approximately 50,000 people of the 100,000 who had a three-day hospital stay but did not meet the three-day inpatient hospital stay requirement. In support of the recommended change, staff suggested that retaining the three-day policy would recognize SNF coverage as a post-acute benefit, not a long-term benefit, and would protect the “financial interests” of the Medicare program. Staff and the Commissioners focused more of their discussion on the issue of beneficiary liability for self-administered drugs (SAD) during the patient’s hospitalization. At present, hospitals charge observation patients “full charges” for drugs. MedPAC reports that in 2012, the average SAD charge was $209, although the average cost to the hospital was $43. Beneficiaries generally pay for SADs out-of-pocket. Some beneficiaries may file an appeal to their Part D drug plans, requesting payment for the drugs at the out-of-network hospital pharmacy, but such coverage, even if successful, would generally not cover the full hospital charges for SADs. Options include allowing hospitals to waive SAD charges for patients in observation, capping the amount that a hospital can charge beneficiaries for SADs at the amount paid for the drugs by the hospital, and including the costs of SADs in Medicare payments to hospitals. The Commissioners discussed CMS’s modifications to the Recovery Auditor program (Issues 2 and 3), which would limit Recovery Auditors to reviewing claims going back six months, instead of the current three-year period. However, the award of the new Recovery Auditor contract that included this limited look-back period was protested in January 2015, leaving in abeyance the new CMS policy for Recovery Audit contracts going forward. The Commissioners recognized that the change is positive and similar to their own earlier discussion of the need to align the Recovery Auditors’ look-back period with the one-year period in which hospitals can rebill Medicare, shifting from Part A to Part B. It is unknown whether CMS’s new look-back policy will be sustained in the contract protest. The Commissioners also discussed at some length the possibility of creating a new one-day inpatient diagnostic related group (DRG) for hospital payments (Issue 1), but recognized that such a change would create a new payment cliff in the Medicare program and could be a step in unraveling the prospective payment system for hospitals. They discussed the House Ways and Means Committee’s discussion draft of the Hospitals Improvements for Payment Act of 2014, released in November 2014 that would, among other provisions, create a new short inpatient payment system and count observation time in the hospital. Offset options suggested to pay for costs associated with counting hospital observation to meet SNF criteria include hospital-related offsets (extending the post-acute transfer policy to hospice) and SNF-related offsets (redesigning the SNF benefit or reducing payments to SNFs). ​Although changes to the three-day stay requirement discussed by MedPAC would help some beneficiaries, many other beneficiaries would continue to be denied Medicare Part A coverage of their SNF stay if their entire stay in the hospital was called observation or outpatient. When the care that patients receive is “often indistinguishable,” whether patients are formally admitted as inpatients or called observation or outpatients, it simply does not make sense to allow the label to determine whether Medicare Part A will cover medically necessary post-hospital care in a SNF. Further, the need for offset options to return to coverage as implemented for most of Medicare’s history is of great concern. The Center and more than 30 other national organizations recommend a simpler, more straightforward approach – counting all time spent in the hospital, whether characterized as inpatient or observation – as provided by federal legislation, “Improving Access to Medicare Coverage Act,” introduced by Congressman Joe Courtney (D, CT) and by162 cosponsors and by Senator Sherrod Brown (D, OH) and 28 cosponsors in the 113th Congress. The bipartisan legislation will soon be reintroduced in the 114th Congress. MedPAC will be considering observation and short-stay issues at its next public meeting March 5-6, 2015. Comments may be sent in advance to MedPAC at meetingcomments@medpac.gov. The Center for Medicare Advocacy has written frequently about observation status. See https://www.medicareadvocacy.org/?s=observation&op.x=0&op.y=0. MedPAC, supra note 1, Slide 2. The Center for Medicare Advocacy is not aware of the origins of the 100,000 figure. The Department of Health and Human Services’s Office of Inspector General reported that in 2012, 617,702 patients who were treated in an acute care hospital for three or more days did not have a qualifying three-day inpatient stay because some or all of the time was classified as observation or outpatient. Office of Inspector General, Hospitals’ Use of Observation Stays and Short Inpatient Stays for Medicare Beneficiaries, OEI-02-12- 00040 (July 29, 2013), http://oig.hhs.gov/oei/reports/oei-02-12-00040.pdf. See CMA, “Observation Status: OIG Provides an Analysis and CMS Issues Final Regulations” (Weekly Alert, Aug. 8, 2013), https://www.medicareadvocacy.org/observation-status-oig-provides-an-analysis-and-cms-issues-final-regulations/. MedPAC, supra note 1, Slide 10. Id. Slides 11 and 12. See CMA, “Submitting Claims to Part D for Prescription Drugs Administered in the Hospital During an Observation Status Stay” (Weekly Alert, May 1, 2014), https://www.medicareadvocacy.org/submitting-claims-to-part-d-for-prescription-drugs-administered-in-the-hospital-during-an-observation-status-stay/. MedPAC, supra note 1. Slide 12. CMS, Recovery Audit Program Improvements, http://www.cms.gov/Research-Statistics-Data-and-Systems/Monitoring-Programs/Medicare-FFS-Compliance-Programs/Recovery-Audit-Program/Downloads/RAC-Program-Improvements.pdf. See CMS, Recent Updates (Dec. 30, 2014), http://www.cms.gov/Research-Statistics-Data-and-Systems/Monitoring-Programs/Medicare-FFS-Compliance-Programs/Recovery-Audit-Program/Recent_Updates.html. See CMS, Recent Updates (Dec. 30, 2014), http://www.cms.gov/Research-Statistics-Data-and-Systems/Monitoring-Programs/Medicare-FFS-Compliance-Programs/Recovery-Audit-Program/Recent_Updates.html. 78 Fed. Reg. 50495, 50906-954 (Aug. 19, 2013). See CMA, “Observation Status: New Final Rules from CMS Do Not Help Medicare Beneficiaries” (Weekly Alert, Aug. 29, 2013), https://www.medicareadvocacy.org/observation-status-new-final-rules-from-cms-do-not-help-medicare-beneficiaries/. House Ways and Means Committee, “Brady Unveils Discussion Draft to Improve Hospital Issues in the Medicare System” (Press Release, Nov. 19, 2014), http://waysandmeans.house.gov/news/documentsingle.aspx?DocumentID=397845. MedPAC, supra note 1, Slide 13. Ann M. Sheehy, M.D., representing the Society of Hospital Medicine, testified that the care is indistinguishable. See Sheehy Testimony, Subcommittee on Health, House Ways and Means Committee, “Current Hospital Issues in the Medicare Program” (May 20, 2014), http://waysandmeans.house.gov/uploadedfiles/052014_sheehy_testimony_final_hl.pdf.